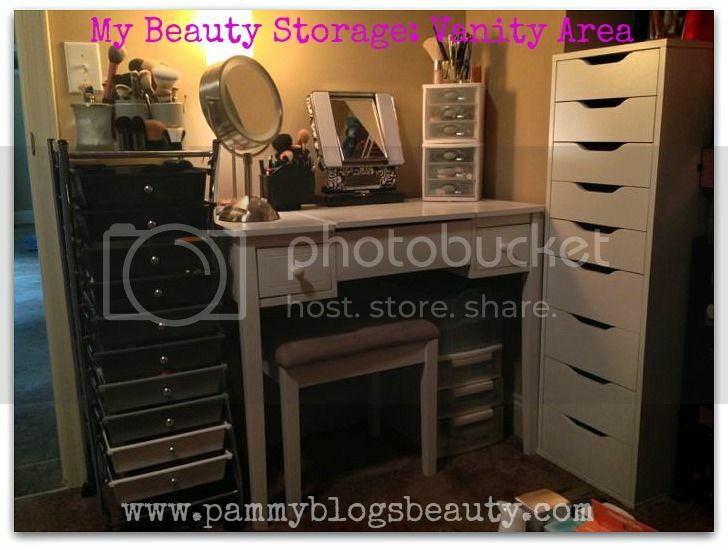 Pammy Blogs Beauty: Makeup Wars: Makeup Storage!!! It is time for another Makeup War! This time the Makeup Wars bloggers are sharing their makeup storage!!! If you are a frequent reader of Makeup Wars posts or beauty blogs in general, then you know that these makeup-obsessed bloggers have a LOT of makeup to store. Storing it in an organized and usable fashion really is quite a challenge! Back to the topic-at-hand: Makeup Storage! As you can imagine, a beauty blogger's makeup collection is constantly expanding and growing. Not only do I purchase and collect makeup, but also I acquire press samples from many brands. I believe in trying to keep my collection as organized as possible so that I can use and experience all of these great products! Yes, it is an excessive collection. Most "normal" people do not need this much makeup. I certainly don't need it either. However, I have amassed quite a bit in my years of blogging and my years of makeup loving. I am constantly trying to clear out and downside my collection. Even as I write this post, I realize that I really need to cut back more. What do I do with makeup that I am no longer wearing or don't need? I pass it on to my family and friends and they are always excited to get it! :) I have also swapped some and have donated unused products as well. So, how do I keep it all organized??? Click "read more" below to find out! My Makeup Collection Storage: A Work-in-Progress: Would love some tips!!! So, here is the current set-up! We just moved about 2 months ago and I am still trying to figure out my Makeup Storage. Moving a large makeup collection was a total nightmare, lol! I am still trying to sort and organize everything. My current beauty area set up is inside my Master Bedroom Closet (which is like a small room off of our Master bathroom). I have enough space for my vanity table, an Ikea Alex 9-drawer storage unit, an office depot rolling drawer unit, and a little rolling cart for my nail polish (not pictured). The grey and black Office Depot rolling cart contains products that I am testing or backup products to use (mostly bath, body, self tanners, and hair products). The vanity table and Alex drawer unit houses the actual makeup collection, spare brushes, makeup bags/travel bags, and even some empty drawer space (yay!). I have various little drawers and glass containers on top for items like makeup that I am testing out, eye and lip pencils, and palettes. My brushes that I use frequently are in this little black spinning pencil holder on top of the vanity. Brushes that I use occasionally are in glass containers on top of the Office Depot drawer set. My large palettes (you can't see them in this picture) are in a file folder holder on top of the Alex storage unit. Smaller palettes are in the deep Alex drawers. The plastic drawers under the vanity table hold my off-season scented body lotions and body splashes (I rotate my scents seasonally) as well as my hair accessories and scarves. I am not totally happy with the setup just yet. Primarily, I don't like the lighting for doing my makeup. I want to get a large lit mirror for over my vanity. I think this would really help! Also, I would really like to dwindle down the collection so that I only have the vanity table and the Alex drawer. I have lots of sorting in my near future! Overall, my vanity/beauty storage area is very functional. However, I feel that it looks "cluttered". So, I am very thankful that this area is inside my closet! Still, I would love to streamline it and give it a cleaner look. What do you think of the setup? Please share any of your tips or finds for makeup storage! :) Also, be sure to click on the thumbnails below to see how other Makeup Wars bloggers store their makeup! Also, I need that mirror in my life NOW! SO GORGEOUS! I really like your setup! I can see why the lighting would bug you though. I love that vanity table. So many of them are too ornate. Where is yours from? I like the rolling drawer unit and really want those for so many things. I love that you have a desk with a stool. I've gotten to the point that I need to sit to do a decent job. 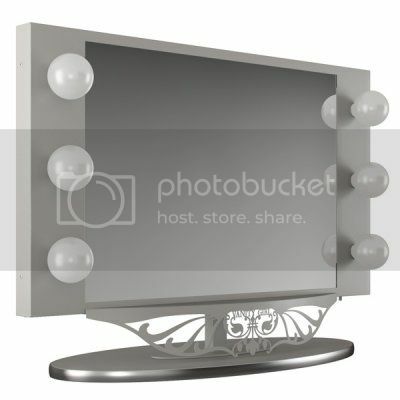 The vanity mirror that you'd like is beautiful and I think you should show this post to your DH as a Xmas hint! @Brooke (Blushing Noir)-lol, give me time girl! I am sure that this closet will be packed soon. We cleared out a lot with the move, but the closet is slowly starting to feel smaller. :) My plan is hopefully to declutter before adding anything new to keep the closet space usable for a vanity area. @Phyrra-Thank you! Yes, hopefully I will solve my lighting dilemma soon! @Teri-Those drawers are so useful! @Andrea-THank you! :) Yes, I must solve the lighting! I love it! All in one place, can't ask for more than that! You've got a good system going for you! It's hard to beat the Alex for makeup storage! I love that mirror that you're loving! I wish I had great lighting like that thing. Looks like I need an Alex! I've wondered for a while how that plastic drawer unit performs. I love my short wide alex!